HANDMADE- Enjoy the handcrafted beauty of this Pure Copper Owl Rain Chain as its water flow creates a beautiful visual and soothing audible experience. 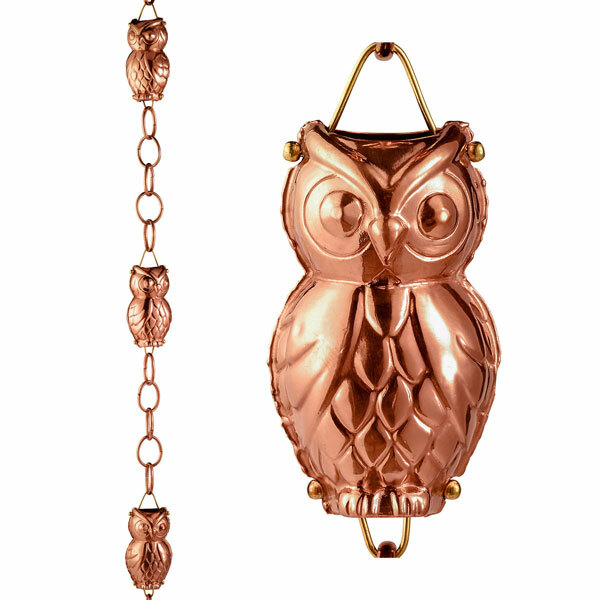 22 GAUGE PURE COPPER - This Owl Rain Chain is made from pure copper that develops a beautiful patina over time. CHANGE THAT BORING DOWNSPOUT - Visually appealing alternative to a traditional gutter downspout. LARGEST IN THE INDUSTRY - Large wide mouth figures better direct the flow of rain water to elegantly cascade down the rain chain. Larger figure design prevents splashing. DIMENSIONS - 8.5' Long; Cup dimensions 3.5"W x 6.5"H.
EASY TO INSTALL - Installation clip included for easy installation. With expressive wide eyes and round compact bodies, it�s not hard to see why owls are so popular these days! Our Good Directions Owl Rain Chain is a visually appealing alternative to a traditional gutter downspout. These hand crafted copper owls are cute and functional, channeling water from your rooftop to the ground. Enjoy the soothing trickle of water during light showers and the flow of cascading water as heavier rain travels down the rain chain. The intermingling of rain and chain create sounds that are delightful to the ears. Bring The Joy of Outdoor Living? to your home with this heirloom-quality piece.